First of all we have to admit that San Francisco was the most beautiful and fascinating stop of our roatrip in US when it comes to urban landscape! Secondly, when travelling we are always looking forward to exploring a city as a local and uncover parts of the city in the most entertaining way! 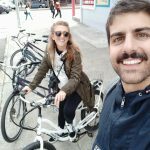 This was exactly why we chose Dylan’s tours for an unforgettable biking experience in San Francisco! We joined The Original City Loop Tour, a 6 hours guided electric bike ride! 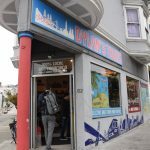 The Original City Loop Tour of Dylan’s tours is the perfect and most authentic way to learn about San Francisco’s evolution, explore popular tourist spots and uncover most of the highlights and neighborhoods that this city has to offer! 15 different locations, countless photo stops, and the only tour featuring the 1,000 acre Golden Gate Park. Enjoy an extended stop at the Golden Gate Bridge for some breathtaking views of the Bay from the bridge. You’ll visit their favorite San Francisco deli for a unique “Bay Area” lunch experience. All bike routes are designed and mastered to avoid traffic, bad roads and assure safety and 100% fun. 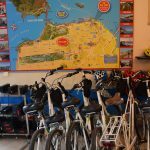 Effortlessly glide over 20 miles on our electric bikes to visit the neighborhoods off limits to other tour companies. Dylan’s Tour guides are both partners and friends. You will never get the “I’m just doing it for money” feeling on Dylan’s tours. 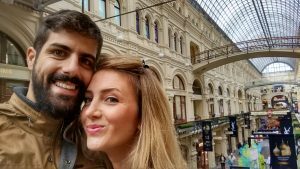 Learn your way around as they ll point out great restaurants and historical sites that make San Francisco one of the most unique US cities. Fisherman’s Wharf :One of San Francisco’s most popular destinations – from beautiful old shipyards, to Boudin’s Bakery and the smell of fresh clam chowder, and of course, the sea lions of Pier 39, Fisherman’s Wharf has it all. Golden Gate Bridge: Declared “one of the 10 wonders of the modern world,” the Golden Gate Bridge not only one of the most recognized symbols of San Francisco, but one of the most photographed sites in the world. Simply stunning! The Painted Ladies: Lining Alamo Square, the Victorians along Steiner Street are the most famous of the Painted Ladies, aka “Postcard Row.” These houses are best known during the opening credits in television’s Full House! 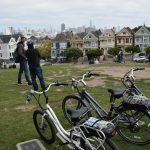 Haight-Ashbury: The origin of the hippie culture and the birth place of the “Summer of Love.” From the stunning Painted Ladies to the homes of music’s favorite 60’s bands, this district started the counter-culture movement across the USA. Golden Gate Park: Clocking in at over 1,000 acres, Golden Gate Park is the largest man-made park in the world. With beautiful Eucalyptus trees, gorgeous gardens and museums that will appeal to all ages (including the De Young and Academy of Sciences), this green space is a highlight of the tour. Marina: A dreamy neighborhood on the edge of the bay, the Marina entices visitors and locals to its boutique-lined streets and hilly green space. Offers unmatched views of the Golden Gate Bridge. Chinatown: Boasting the largest Chinatown in the United States, this 24-block mecca is bustling with energy, amazing food, and unique and colorful shops that give this area its charm. North Beach – Little Italy: Voted as one of the USA’s “ten great neighborhoods”, North Beach is best known as the home of Little Italy. From delicious restaurants to authentic sidewalk cafes and bakeries, you will feel the charm of San Francisco as soon as you arrive. Fort Point: Located just beneath the Golden Gate Bridge, Fort Point gives you a front row seat to the San Francisco Bay. This former military fortification was used during both the Civil War and World War II. Aquatic Park: Positioned near the end of the Hyde Street Cable Car, Aquatic Park is a National Historic Landmark on the San Francisco Bay. Featuring one of the cleanest beaches in California, be on the lookout for the bold open water swimmers who frequent the area. Palace of Fine Arts: Inspired by Roman and Greek architecture, the Palace of Fine Arts was originally constructed to celebrate San Francisco’s recovery from the 1906 earthquake. Surrounded by a peaceful garden, it is great for photos. Ocean Beach: Bordering the Pacific Ocean on the western edge of San Francisco, Ocean Beach is a popular destination for seasoned surfers. Characteristically foggy, the area offers a serene setting outside of the bustling city. Sea Cliff: Noted for its large houses and ocean views, Sea Cliff’s past residents include actors Robin Williams, Sharon Stone, and billionaire George Soros. Cliff House restaurant is closeby, sitting directly on the Pacific Ocean. Legion of Honor: Called San Francisco’s most beautiful museum, the palace occupies an elevated site in Lincoln Park and displays a collection of ancient and European art, in an unforgettable setting overlooking the Golden Gate Bridge. Lunch available for purchase at stop (vegetarian options available). They will show you their favorite places to grab a memorable photo during your trip! 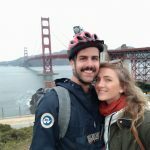 Moreover Dylan’s tour’s team was rather than helpful and tried their best for us to experience th beauty of San Francisco and they provided us an extra list of some of their favorite things to do in San Francisco! Find our more exciting places by Dylan’s tours in SF in our blog post about SF! For more info and more tours to explore visit the official website of Dylan’s tours and feel free to ask any questions to this amazing team, we assure you that they ll response immediately and provide you the whole details you are asking for! 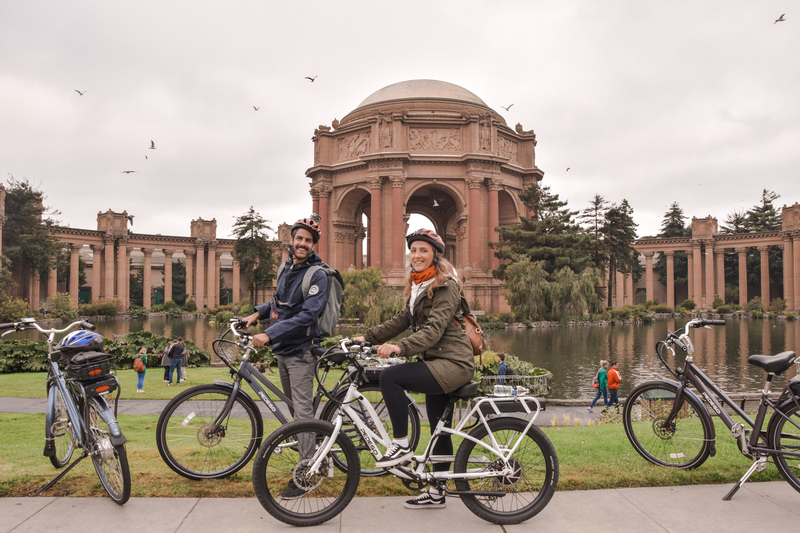 It goes without saying that this was the best way to discover SF in just 6 hours of riding those amazing electric bikes and being a part of this team! If anyone needs more San Francisco inspiration or wants to find a good guided tour, this is a great resource! Last but not least here is a great gift for our readers only! Get a 10% discount when you check out! 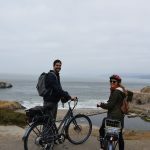 The electric bike tour was complimentary by Dylan’s tours, though all opinions remain own own and are based on personal experience during the Original City Loop Tour in San Francisco! Many many sincere thanks to Dylan for the amazing experience!